Nick, keep up the good work, not everyone likes to use the Saturn patch, in my case I like to modify the database on my own accord after the guys share the update, it's nice to have alternatives. my game turns off after a match has finished can you figure out why that is the case? Found something, when you choose the option to make all players available and force load all players, then in the game when you use the search tool by age, imagine you are looking for players in the 25 to 30, they dont show up, but when you search for players in the 32+ you find players with 30 years old, that you should find using the 25 to 30 before, if it makes sense. Only error is v3.9.68 index..cpp 5809 every time I open saved game, but doesn't make any problems. Well memory problems sometimes but can pass with 2-3 tries. i want to play with old values, so what should i do in currency inflation? Saturn not working on my laptop therefore used this patch...it looks great apart from one error- when I select start year 2018 all the players appear at least 10 years older I.e. most in their 40’s... any ideas? Was it an existing save or a new game? 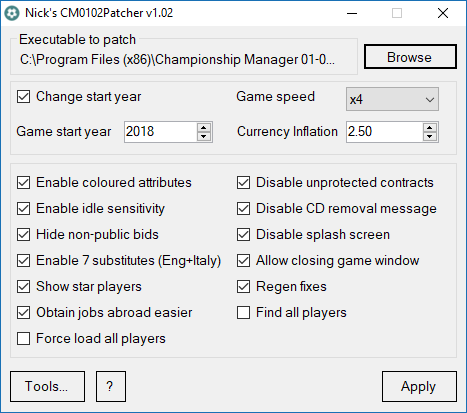 Since I've played (the last update) with this patcher on, everything is fine except one big thing which isn't a tech issue : my tactics no longer work as good as they used to. Anyone has an explanation ? I feel like every opponent has a team build to tactically counter me. Thanks in advance for the answer. I think there is nothing in this tool related to it. It probably relates more to any other patches you might have applied, or to the updated database, because if my memory dont fail then I remember reading in this forum that in the updated databases the managers have better intrinsic attributes of 'tatical knowledge' and this makes the AI slightly harder during matches compared to old databases. Someone correct me if im wrong please. 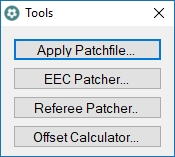 It also has a tools section with things like a patch applier that can apply .patch files from things like Flex 2 or patch files made with "fc /b cm0102_original.exe cm0102_patched.exe > newpatch.patch"
Obviously, all the credit for this should really go to Tapani, JohnLocke, Saturn, etc who have come up with all these great patches! I really just made this for myself, so it's a little untested but seems to work well enough. I started a game with all leagues (inc conference, etc), max db, starting in 2018 and it played for a good few seasons with no errors. Hope it's useful/of interest to somebody Let me know if there's any other little feature I should add. So now Im playing CM with your patch, and almost everything in this particular save is running alright. I am now in my second season and I noticed something akward( or maybe not). When I go to fixtures, I cannot see my previous season!! So I have no way to see the games of last season !! Did you know about this impossibility ? It could be the case that only happened to me, I don`t know. Anyway, I have to point out that I like this patch so far. I'm in 2024 at the moment, started in 2018, no problems whatsoever. I ran this patcher on the basic 3.9.68 data and changed the start year to 2002, which is effectively what the .68 data was. But all the players ages are 1 year too young now. What have I done wrong? Or how can I change it? I'm using the ODB and have made my own data update (with 13 yo Messi, 100s of RL future transfers etc). So the question is - which patches can be safely applied to the ODB (or any other ones that are not the latest). There are about 80 or 90 patches in this collection, one by one have I tested them and those that change game play (eg. loan boost), player restrictions (subs), fixture changes (champs league), etc work fine. But (obviously) any to do with league structures, WC, B teams, etc do not.